When I was young I often picked up this book, but only because I loved the cover. My father used to carry it around with him and dipped in and out of it, especially when we were on holiday at my grandparents’ house in Manchester. It wasn’t until I was 19 that I set about reading it myself. Now, at 39, I’ve lost count of the number of times I’ve read it. When I retrained as a language teacher after leaving interpreting, the ideas and ideals of this book were strongly with me. Anyone who is remotely interested in learning how to ‘enjoy the journey’ of learning should buy it. Below is a quote that has always stayed with me. School is not like this. School will never be like this. 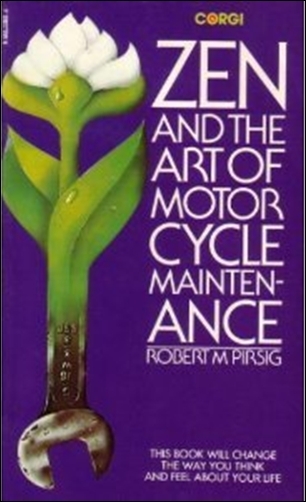 But the idea of Pirsig’s muse is exciting. Why? Because it is based on the total freedom of the individual to engage… or not. Since there was no degree or grading system he would incur no penalty for this. Subsequent lectures which presumed he’d completed the assignment might be a little more difficult to understand, however, and this difficulty, in turn, might weaken his interest to a point where the next assignment, which he would find quite hard, would also be dropped. Again, no penalty. The student’s biggest problem was a slave mentality which had been built into him by years of carrot-and- whip grading, a mule mentality which said, “If you don’t whip me, I won’t work.” He didn’t get whipped. He didn’t work. And the cart of civilization, which he supposedly was being trained to pull, was just going to have to creak along a little slower without him. This is a tragedy, however, only if you presume that the cart of civilization, “the system,” is pulled by mules. This is a common, vocational, “location” point of view, but it’s not the Church attitude. The Church attitude is that civilization, or “the system” or “society” or whatever you want to call it, is best served not by mules but by free men. The purpose of abolishing grades and degrees is not to punish mules or to get rid of them but to provide an environment in which that mule can turn into a free man. The hypothetical student, still a mule, would drift around for a while. He would get another kind of education quite as valuable as the one he’d abandoned, in what used to be called the “school of hard knocks.” Instead of wasting money and time as a high-status mule, he would now have to get a job as a low-status mule, maybe as a mechanic. Actually his real status would go up. He would be making a contribution for a change. Maybe that’s what he would do for the rest of his life. Maybe he’d found his level. But don’t count on it. In time…six months; five years, perhaps…a change could easily begin to take place. He would become less and less satisfied with a kind of dumb, day-to-day shopwork. His creative intelligence, stifled by too much theory and too many grades in college, would now become reawakened by the boredom of the shop. Thousands of hours of frustrating mechanical problems would have made him more interested in machine design. He would like to design machinery himself. He’d think he could do a better job. He would try modifying a few engines, meet with success, look for more success, but feel blocked because he didn’t have the theoretical information. He would discover that when before he felt stupid because of his lack of interest in theoretical information, he’d now find a brand of theoretical information which he’d have a lot of respect for, namely, mechanical engineering. Such was Phædrus’ demonstrator, his unpopular argument, and he worked on it all quarter long, building it up and modifying it, arguing for it, defending it. All quarter long papers would go back to the students with comments but no grades, although the grades were entered in a book. As I said before, at first almost everyone was sort of nonplussed. The majority probably figured they were stuck with some idealist who thought removal of grades would make them happier and thus work harder, when it was obvious that without grades everyone would just loaf. Many of the students with A records in previous quarters were contemptuous and angry at first, but because of their acquired self-discipline went ahead and did the work anyway. The B students and high-C students missed some of the early assignments or turned in sloppy work. Many of the low-C and D students didn’t even show up for class. At this time another teacher asked him what he was going to do about this lack of response. His lack of harshness puzzled the students at first, then made them suspicious. Some began to ask sarcastic questions. These received soft answers and the lectures and speeches proceeded as usual, except with no grades. Then a hoped-for phenomenon began. During the third or fourth week some of the A students began to get nervous and started to turn in superb work and hang around after class with questions that fished for some indication as to how they were doing. The B and high-C students began to notice this and work a little and bring up the quality of their papers to a more usual level. The low C, D and future F’s began to show up for class just to see what was going on. After midquarter an even more hoped-for phenomenon took place. The A-rated students lost their nervousness and became active participants in everything that went on with a friendliness that was uncommon in a grade-getting class. At this point the B and C students were in a panic, and turned in stuff that looked as though they’d spent hours of painstaking work on it. The D’s and F’s turned in satisfactory assignments. In the final weeks of the quarter, a time when normally everyone knows what his grade will be and just sits back half asleep, Phædrus was getting a kind of class participation that made other teachers take notice. The B’s and C’s had joined the A’s in friendly free-for-all discussion that made the class seem like a successful party. Only the D’s and F’s sat frozen in their chairs, in a complete internal panic. The students added that once you got used to it it wasn’t so bad, you were more interested in the subject matter, but repeated that it wasn’t easy to get used to. At the end of the quarter the students were asked to write an essay evaluating the system. None of them knew at the time of writing what his or her grade would be. Fifty-four percent opposed it. Thirty-seven percent favored it. Nine percent were neutral. On the basis of one man, one vote, the system was very unpopular. The majority of students definitely wanted their grades as they went along. But when Phædrus broke down the returns according to the grades that were in his book…and the grades were not out of line with grades predicted by previous classes and entrance evaluations…another story was told. The A students were 2 to 1 in favor of the system. The B and C students were evenly divided. And the D’s and F’s were unanimously opposed! This surprising result supported a hunch he had had for a long time: that the brighter, more serious students were the least desirous of grades, possibly because they were more interested in the subject matter of the course, whereas the dull or lazy students were the most desirous of grades, possibly because grades told them if they were getting by. Phædrus thought withholding grades was good, according to his notes, but he didn’t give it scientific value. In a true experiment you keep constant every cause you can think of except one, and then see what the effects are of varying that one cause. In the classroom you can never do this. Student knowledge, student attitude, teacher attitude, all change from all kinds of causes which are uncontrollable and mostly unknowable. Also, the observer in this case is himself one of the causes and can never judge his effects without altering his effects. So he didn’t attempt to draw any hard conclusions from all this, he just went ahead and did what he liked. The movement from this to his enquiry into Quality took place because of a sinister aspect of grading that the withholding of grades exposed. Grades really cover up failure to teach. A bad instructor can go through an entire quarter leaving absolutely nothing memorable in the minds of his class, curve out the scores on an irrelevant test, and leave the impression that some have learned and some have not. But if the grades are removed the class is forced to wonder each day what it’s really learning. The questions, What’s being taught? What’s the goal? How do the lectures and assignments accomplish the goal? become ominous. The removal of grades exposes a huge and frightening vacuum. What was Phædrus trying to do, anyway? This question became more and more imperative as he went on. The answer that had seemed right when he started now made less and less sense. He had wanted his students to become creative by deciding for themselves what was good writing instead of asking him all the time. The real purpose of withholding the grades was to force them to look within themselves, the only place they would ever get a really right answer. But now this made no sense. If they already knew what was good and bad, there was no reason for them to take the course in the first place. The fact that they were there as students presumed they did not know what was good or bad. That was his job as instructor…to tell them what was good or bad. The whole idea of individual creativity and expression in the classroom was really basically opposed to the whole idea of the University. For many of the students, this withholding created a Kafkaesque situation in which they saw they were to be punished for failure to do something but no one would tell them what they were supposed to do. They looked within themselves and saw nothing and looked at Phædrus and saw nothing and just sat there helpless, not knowing what to do. The vacuum was deadly. One girl suffered a nervous breakdown. You cannot withhold grades and sit there and create a goalless vacuum. You have to provide some goal for a class to work toward that will fill that vacuum. This he wasn’t doing. He couldn’t. He could think of no possible way he could tell them what they should work toward without falling back into the trap of authoritarian, didactic teaching. But how can you put on the blackboard the mysterious internal goal of each creative person?